It's been around 20 degrees or lower outside this whole week & yesterday I woke up to snow on the ground. I'm pretty sure I've seen more snow this year than in my entire lifetime. I nearly froze to death bringing the trashcan around! It's supposed to be below freezing the rest of the week & the little snow icons are showing up all over the forecast app on my phone. I checked out the ModCloth Cabin Fever Sale (perfectly named for what I'm feeling! It's just too cold to go outside!) to see if any fun winter items like tights & jackets were included. Guess what: they totally are! The sale is 70% off too, what a score! Look how awesome these Wildflower Mix Tights are! And what about these Once & Floral tights? Love 'em! 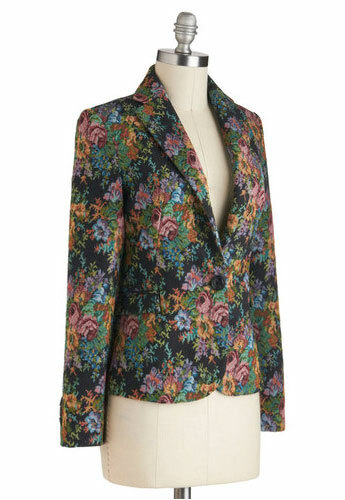 This Tapes-tres Chic Blazer makes me melt. I'd totally rock this with gray tights! 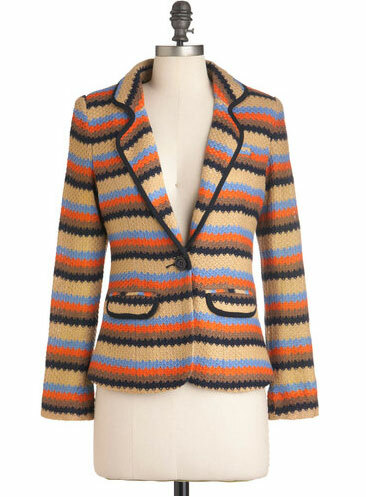 This Literary Strip Blazer makes me happy too! Am I the only one that need color all through the year? When others go to blacks, browns, & grays I'm trying to transition my summer dresses into fall & winter looks! It's a challenge to find happy colors durring winter time & I've noticed its even harder to find happy colors up north because you never want to go outside! I kid, I kid. I'm going to continue to snuggle up under my heated blanket & peruse this 70% off sale. I might get lost in the shoe section as well! I'm a fan of everything except that last blazer. Those tights are so freaking awesome. I'm already imagining what I can wear them with. It's a good thing you aren't in Michigan anymore! We hit 11 degrees today and I nearly shouted for joy. With the wind chill it's been below 0 most days lately. I'm telling you, it's brutal. Hahaha. It's a good thing I work at a company that sells hand warmers!